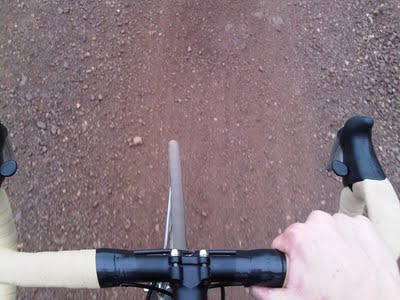 Dan of Portland Design Works has been riding the B-Side (our 650b wheeled hardtail) for a review in Bike Magazine. He has it built up with XTR, a White Brothers Magic80 fork, and ....elk spine. 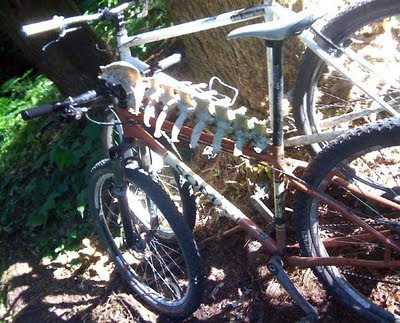 Skeleton was found on a ride on the Lewis River Trail. Head was missing so they couldn't be sure it was an elk. Here are pictures of our 48h track hubs as promised last week. The wheel picture is courtesy of Bell's Bike Shop in Philly. 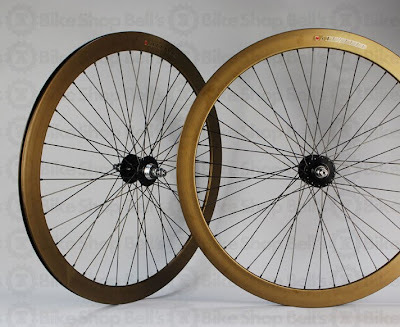 The rims are Velocity B43's in bronze. We only made 50'ish and Bell's has them all (except for 3 sets we sent to the HBPWC). If there is interest from you the masses, we'll make more. Montana Norvell, Director of the Hardcourt Bicycle Polo Federation, approached us a few months back to help support this Labor Day weekend event. The guy sure knows his polo and writes the most professional " we want schwag" letter, but I was most enamored was of the beautfully simple poster image that takes me back to my days studying graphic design. Futura was the favorite font of the SJSU graphic department when I was there. 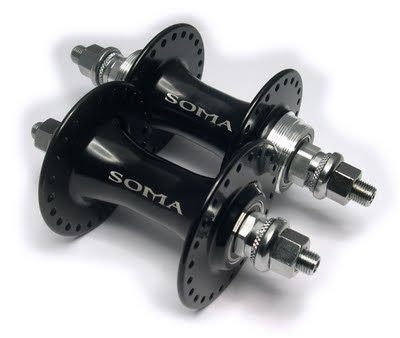 We are offering a Soma Rush frame for an individual prize and 3 sets of 48 hole versions of our SoMax track hubs as a team prize. We only made 50 sets of these "polo hubs" and most are available at Bell's Bike Shop (coincidentally is also in Philadelphia.) We'll post pictures of them when we can. Thirty five teams have signed up so far. Spectators are welcome to attend the free of charge. The event is also sponsored by Trophy Bike Garage, another awesome Philly shop that carries our stuff. August 20th! Bring money. Buy lots of alcohol. It's for a good cause. Plus there's a chance you'll win a Soma Rush frame. Click on the poster to enlarge. There's also a race before the party. Registration begins at 5pm for that. Our friends up at the Bicycle Business in Sacramento built up their dream commute bike, using our Double-Cross Disc as the base. Shimano Dynamo front hub, Paul Thumbie shifter and chain guide, Shimano Alfine brakes, Sycip Wonder bar, Cardiff Wessex saddle. The fenders are hammered Honjos, the rear rack is a Nitto R15. The Swiss-made Pletscher double kickstand looks perfect for this setup. The upright position, all weather fenders and disc brakes, generator light, comfortable saddle, sturdy (and classy) rear rack, and 1x9 drivetrain all speak to commuting reliability and comfort. You can actually buy this build, should you like it as much as we do. tasty schwag for the winners of the competition. The Victoria Theater will be running two showings -- 7pm and 9pm. 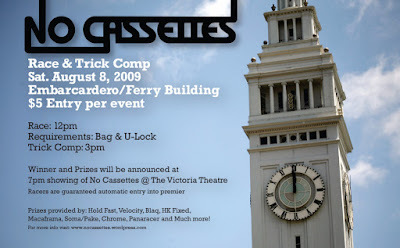 See the No Cassettes trailer at Fatlace. 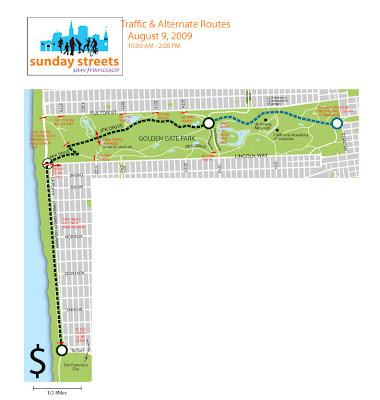 Another Sunday Streets is upon us! The last few were definite successes and this Sunday August 9th, from 10am-2pm, will be the next one. This may arguably be the greenest and prettiest route yet, which will be taking everyone car-free through the park and then down along the ocean, ending at the SF Zoo. Check the link for the full activity list, but this will definitely be a family-friendly, all ages and abilities ride. Another foggy/misty/wet Saturday morning...what else but summer riding conditions in San Francisco. 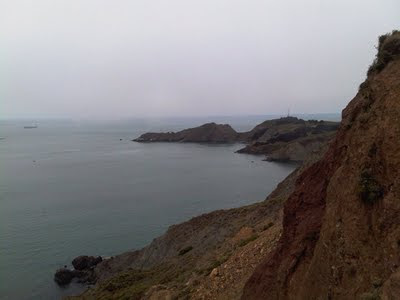 The ride for the day took us over the Golden Gate and into the Marin headlands. Riding along the twisty road that hugs the coast just across the water from SF, you have the option of stopping every quarter mile or so to check out former WWII gun battlements. Ranging from small lookouts only large enough for one person to massive turrets the size of single-family homes, I have always found it fascinating to investigate these bits of history. Channeling Rivendell, some dirt riding on our road bikes to get back up from the valley we descended into. Ran New Xpress 23c's, and I can honestly say they handled reasonably well. The stem appears very crooked from this angle, but I can assure you, it is on straight. I feel like we have gone straight from winter/early spring (I have commuted in a t-shirt maybe twice this year) into fall. We'll keep our leg warmers on, while I'm sure the rest of you are enjoying sunny days and warm evenings. 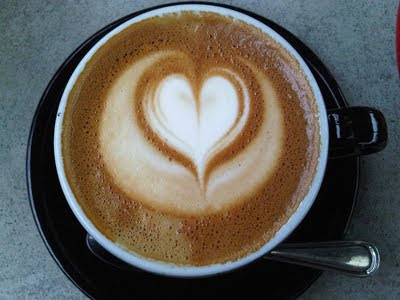 Coffee made with love, offering up some internal warmth after a chilly ride.